Students can access their student device app inventory or parents can access device inventory for all of their students in the Infinite Campus Portal. If you need assistance with your portal account please refer to the Infinite Campus Help Page. On ce you are logged in to your Infinite Campus Account you will see a Tech Info Link on the lower left hand side. Click this link and a screen will open. If you are a student the next screen will list pertinent information about your technology environment. If you are a Parent you will see the same information listed for each of your students. For listing device App information we are looking for the link at the very bottom of the table labeled Mobile Device Info. 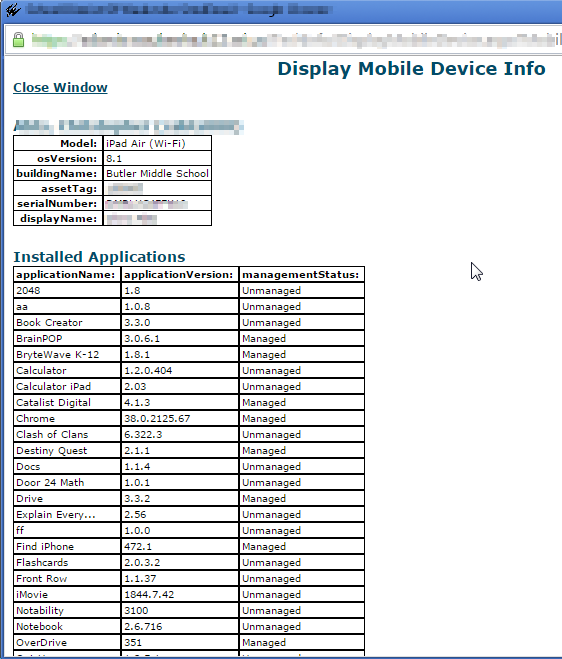 Click this link and an additional screen will open up listing the apps that are installed on the students device. You can also edit information on the tech info page for your students. This is helpful for families to have a secure way to communicate with teachers if you set restriction codes or change a students Apple password. This video describes how to edit that information.